THE RUSTY WHEELBARROW with unusually straight legs resting on small wheels would be the focal point in Dove Cote Studio were it not for the large collection of recent paintings on reconstituted paper by visual artist Edward R. Whiteman. On a day when the weather is grey in anticipation of the next cold front, the vibrancy of what life in the studio means to this man and his work is evident before a word is exchanged. His most recent paintings on paper line the walls of his workspace. They are expansive, and each invites multiple interpretations. Unframed, rich black lines enclose an array of shapes and washes of color, pushing and pulling the viewer’s eye beyond the borders into the world from which the images spring. Inevitably, the eye returns for more. Accomplishing such a feat is a complex endeavor. It requires a deep and abiding connection between the artist’s interior experiences and the conviction that connecting to the exterior world is essential nourishment for his work. Whiteman’s process is rooted in respect for humble materials. He is not seeking perfection in a conventional sense. He is drawn to weathered things, wounded inanimate objects, once functional and enduring over time. As Whiteman speaks, my eye returns to the wheelbarrow. What first appeared to be a bundle of twigs is a collection of rusty shapes snipped and repurposed by Whiteman from metal fencing. The variety of shapes appear to form a jumbled, three-dimensional vocabulary, a visual stimulus for Whiteman’s interaction with materials and form during his decision-making process. He considers the shape and scale of each in relation to the size of the heavyweight Arches paper placed on the floor. Using black oil sticks and translucent tracing papers, Whiteman draws the chosen rusty shapes, then places the drawings on the heavyweight paper, shifting them about and pushing them to the point where content and materials come together in a satisfactory arrangement. Water baths are essential in various stages of reconstituting the paper, creating texture and dimension. Once the drawings are transferred, the paper is completely submerged and dried more than once. The process is not precious, but rather vigorous treatment to produce a sturdy surface strong enough to support even the largest paintings. As an extra precaution, Whiteman reinforces the rear top border with a layer of canvas secured with Elmer’s Glue-All. Whiteman has used this product for years, and his respect for the simplicity of the all-purpose glue is apparent. He describes the day when a worker clearing debris from a closet found one of his unframed paintings. Without realizing he was folding a completed work of art, the workman carefully handed what appeared to be an envelope to the artist. Whiteman knew immediately that the intention was well meaning, but the condition of the painting was precarious due to meticulous folding. Determined and confident in the strength of his materials, Whiteman promptly submerged the painting in water five times, drying between cycles over many days, until crease lines were no longer evident. A fidelity to process and a high standard of craftsmanship make paintings and relief sculptures by Edward Whiteman distinctive and particular to his style. According to Whiteman, “Without craft, the visual artist cannot make symbols or signifiers of creative thought manifest.” He continues, “Philosophy and art have always been areas of interest important to me. The theories of Carl Jung and his research on archetypal imagery and cubism as practiced by Picasso and Braque revealed new ways of thinking about form and space. The shattering of the single point of view in perspective, the essence of the cubist movement, aligns with the way I perceive things. We think we see something as it really looks when we only see the front. The more realistic depiction in thinking of the whole person or object is the three-dimensional view. “I grew up in New York on the Lower East Side. When I was 7 or 8, I was given a pad and pencil to occupy my time during long church services. I drew what was before me, the backs of people in the congregation. Women with the most interesting hats were favored for the exotic shapes resting on their heads, some with fruits, feathers, flowers, and most memorable to this day, the head of a fox. We did not have much money, so after services, I shared the drawings with my unsuspecting subjects for a nickel. This was my first realization that I might make a living as an artist. When I was older, I enrolled in art school in the commercial art program. I had no great experience with the breadth of the art world at that time. After classes, I would explore the building and discovered what was going on on the second and third floors was much more to my liking. I met the professor of fine art, who was a total abstractionist. He was responsible for my earliest motivation to branch out and experiment. Whiteman moved back to the city when the abstract expressionist movement shifted the attention of the art world from Paris to New York. Short on funds yet convinced of his ability to make it as an artist, Whiteman moved to the Lower East Side. He recalls the scale and proximity of the close living quarters there. Looking out and up meant that you would see the tops of objects on shelves in other apartments. He recalls a fascination with the shapes, usually portions of objects that had served their purpose but retained some residual memories for the owner. An opportunity to travel to England and live in the countryside near the ocean resulted in eight years abroad before returning to New York and a teaching position at the Arts and Crafts School in Harlem. A spike in violent crime, drugs, a meager police presence and rapidly deteriorating living conditions in his neighborhood convinced him that he had to leave because he could not afford to live anywhere else in the city. New Orleans became a possible destination, with a connection to well-known artist Robert Gordy. Simone Stern Gallery was one of the oldest and most highly regarded galleries in the city, and Gordy suggested the gallery might be interested in his work. Whiteman’s reputation grew rapidly. When Simone Stern Gallery closed, Whiteman joined and remains represented by Arthur Roger Gallery. 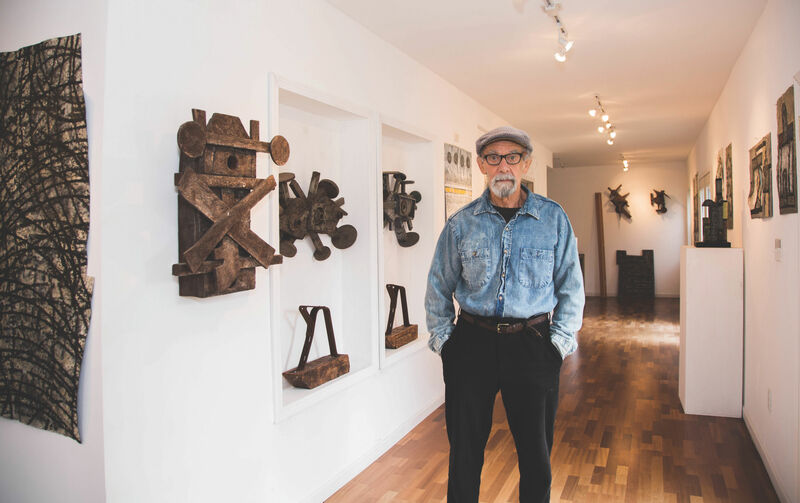 Whiteman spent long days in a small shotgun house and studio during his time in New Orleans before he made the decision to move to Abita Springs and expand his enterprise into a complex of home and studio. Today, Dove Cote Studio is located in Covington on a swath of land where hay bales dot wide-open spaces. He lives with his wife and companion, Pat, in a home with a wrap-around porch within walking distance to Dove Cote Studio. Pat’s background is in dance, and her awareness of the importance of the cultural arts becomes evident in our discussion. The title of Whiteman’s latest series, Quilted Snapshots, grew out of a conversation about the series with Pat. As I look at Whiteman’s work, I am aware of formal qualities of shape, line, composition and texture. To Whiteman, the process is the manifestation of a much more complex and intuitive process involving both his mind and the world around him. Pat sees the symbolic content of not only the composition but also the more objective view of how the work connects to life. We speak of quilts and the traditional method of sewing together blocks of color. The geometric shapes are attached to a support backing that unifies the parts into a whole. Traditional quilts serve a functional purpose. Snapshots, like the snapshots of a Polaroid, reference the moment when the eye recognizes the intersection of the visible world and the point of view of the photographer. In combining the two into the series title, there is an opportunity for viewers to enter the paintings and attach nuances of thought, their own interpretations. To see more paintings by American artist Edward R. Whiteman, visit edwhiteman.com or Arthur Roger Gallery, New Orleans.